Desert Oasis Recovery, an Albuquerque, New Mexico based drug and alcohol addiction treatment center, announces their new day treatment addiction treatment program. A day treatment program includes most aspects of an inpatient addiction treatment program and is well suited for those individuals requiring less structure than inpatient clients dealing with drug and alcohol addiction. There are people currently living in a drug-free or addiction-free environment that still need the direct support and guidance from a addiction treatment program. Desert Oasis Recovery, an Albuquerque, New Mexico based drug and alcohol treatment center, one of only two privately run centers in the State of New Mexico, announces their new Day Treatment Addiction Treatment Program. Local New Mexico clients that live in a drug-free or addiction-free environment that require less structure than inpatient clients dealing with drug, alcohol and other addictions now have an program available that can help them deal with their addictions via Desert Oasis Recovery's Day Treatment Program. Per Tami Pacheco, Desert Oasis Recovery's Executive Director, "There are people currently living in a drug-free or addiction-free environment that still need the direct support and guidance from a addiction treatment program." This program offers most of the features and aspects of an inpatient drug and alcohol addiction treatment programs. Individuals can enroll for four to six weeks and can participate in all the curriculum, guidance, personal counseling, group therapy, mentoring, and medical support. The program is also offered on weekends as well. 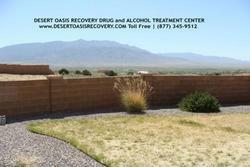 Desert Oasis Recovery is a New Mexico In-patient, and out-patient alcohol, drug, and gambling treatment center. Our staff is made up of people who genuinely care and take extreme pride in providing the best help for chemical dependency, alcohol addiction, and other addictions such as gambling.